How many of you don’t know my story? I took down my before & after page a long time ago, and I just realized that a lot of you never saw it because you are new! I guess it is time to share. Many of you know that I lost someone close to me a few years ago. I was a freshman in college, and was devastated. Without realizing it I started to gain weight. Looking back on it I think it was a combination of eating whatever was put in front of me- blindly (because I couldn’t even taste anything for months)- and probably some form of emotional eating. By the time I started senior year of college, I tipped the scale around 165 lbs. That was fall of 2004. By summer of 2007 I had lost 10 lbs and was hovering around 155 lbs. It was a slow loss that happened by eating normal meals. Somehow by eating more (and better) and eating regularly I had lost weight. I have always loved exercise and was always active, so for me the key component was what I ate. I met PhillyBoy in June of 2007 and we started dating. My trip to Greece was only a few weeks after we met, and I remember being unhappy in my clothes. In the fall of 2007 I was 152 lbs and didn’t know what to do to lose more weight. I knew that my body was still not where it wanted to be and I wasn’t sure how to get there. I googled around and ended up joining calorieking.com in February 2008. Calorie King is a great online tool for tracking calories (it is not free though). From February to May I worked hard to lose weight. I ate net 1200 calories a day (net means that if I burned 300 calories through exercise I would eat 300 more, equaling 1500 calories of food that day), and lost weight. For me it meant I averaged 1600-1800 calories a day, and while I wasn’t constantly hungry, sometimes I thought I was (it was just thirst- I used Kath’s trick of drinking a glass of water first to see if it was hunger or not). In May 2008, on the day of our engagement, I weighed in at 140 lbs. I had lost 12 lbs in 3 months, for an average of about 1 lb/week. I didn’t think I could continue to lose weight without wanting to overeat a lot etc, so I decided to just try to maintain my weight for 6 months before losing more. Now and then I tried to lose a few lbs but it didn’t really work. I enjoyed eating whatever I wanted, but by August of that year I had lost 2 more lbs and was around 138 lbs. From the fall of 2008 until our wedding day on July 25, 2009 I maintained my weight within a 4 lb range easily. I exercised and ate well, but enjoyed treats and didn’t care if I missed a workout. My range was 138-142 lbs, and I was very comfortable with my body. I am 5′ 7″, and I felt strong and lean. I never believed my friends when they told me to be careful of gaining weight after our wedding. I should have believed them, because I did. I had been used to eating skimpy dinners (I love big breakfasts and lunches) but all of a sudden I was cooking nice meals for PB, and then eating them too! Even though they were healthy dishes, I just ate too much. Also, I started to work from home. The lack of social interaction led me to sneak into the kitchen a little too much for a bite of chocolate or just a little piece of bread. I had gained real weight. I was PISSED. So for a few weeks I worked on adjusting my diet so that I eat a little less during the day and can enjoy dinner with PhillyBoy at night. The recipes I post here are taken directly from the meals we eat, and I focus on making a healthy dinner every night that PhillyBoy will still enjoy so that we are both satisfied, while not spending too much time in the kitchen. I got back to my comfortable weight range, and I was happy about that. What comes after love and marriage? Babies of course. For the first time in my life I gained weight happily. Perhaps I gained it a little too happily because at my last weigh in before having the baby I had gained 45 lbs. I reached my pre-pregnancy weight when my son was 8 months old, just in time to get pregnant again. My body was very different though. 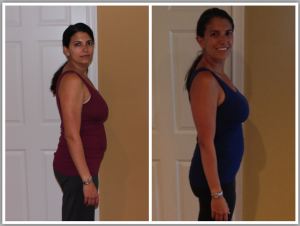 I had started the pregnancy higher than my normal weight by about 10-14 lbs. My second daughter was born in May 2015, 2 years after my first daughter. She’s now 8 months old, and after a lot of hard work I still have 15 lbs to lose. It’s amazing how different each postpartum weight loss has gone. I’m working hard and will get there in time. When I do, I’ll update with more photos! To me weight is always just a number, and it doesn’t really matter. I am not emotionally affected by what the scale reads, but I know that my weight is a good indicator of change for me. Like everything else in life, it has its ups and its downs. When I gain a couple of lbs I just reevaluate my diet and make a few adjustments until my clothes feel comfortable again. I have come so far from who I was years ago. I eat a mostly real food diet. That means old fashioned oats, fresh vegetables, lean protein, seasonal fruits, whole grains, chocolate and more. I don’t feel my day is complete without some form of exercise. Since becoming a mother it’s less than before, but I do my best. I am happy every day. I love my life. Thank you for taking the journey into the past with me. Join me for the ride as I get back into shape. As always, thank you for reading. Sabrina! You are beautiful and you have worked so hard! Thank you for sharing YOUR story! I had no idea when I shared mine with you NYC how many similarities we share! Thank you for your encouragement and inspiration! As you know, my journey is not over either! 🙂 Close to my comfortable range! Look forward to trying your recipes! @CarolinaMama, Hi! Yes, I did not have a chance to really share my story with you, but I have lost weight and have been now maintaining it for a few years!!!! Keep up the good work- you are gorgeous! sabrina, you are fantastic, it is not easy to do what you have accomplished. you are an inspiration to all of us. I just started really reading your blog even though I’ve always stopped by when seeing your name on Twitter and other places. Anyways, thank you for your story. It’s another example of another real person and very honest. Also, I like how you said that your journey isn’t over because whose is? 🙂 I’m still in my journey and have been forever. Hopefully one day, I will feel a little better about where I am. Wow, Rhodey Girl, I just stumbled across your blog as I was researching (in a panicky sort of way) the best ways to complete my first half marathon (San Jose Rock & Roll this Sunday!). I’m about the same height and (before) weight as you and have been slowly, slowly trying to get back down to my “fighting” weight. I love your blog! I also believe in eating a wholesome, close to the earth diet (to quote Michael Pollan: Eat Food, Not Too Much, Mostly Plants). It’s not working so well for me though! lol But I’ll keep at it! Start weight 170, current weight 160, goal weight 145. @Eline, Thank you so much!!!! Best of luck on the race- you will be fine. Just take your time and have fun! I loved reading your story and have just begun my own journey of getting to that feel great weight, which for me would be about 10-25 pounds less. My question to you is, were you able to avoid stretch marks? If so, what was your secret? I know losing weight gradually will prevent them, but sometimes when the skin is stretched too thin, it’s nearly impossible to do so. I’ve already got some from being heavier in high school and just would like to prevent some more. They’re just so unattractive and makes me self conscious in a bikini. @trang, Thanks. #1 tip for stretch marks is to buy Bio Oil. Use it everywhere you already have them and everywhere you think you could get them. I didn’t get any from losing weight as I lost it verrrrry gradually. I did, however, get them from gaining weight in high school and I hate them so much. I am pregnant now and just hoping to avoid them on my belly since I already have some on my hips and thighs. I still wear a bikini thought! Amazing story! Losing weight will give you good shape. Good shape will give you a bit of good mood each time you look in the mirror. In my case it’s a perfect motivation for attaining my further goals in life. What helps me to keep good shape is fitness and right nutrition (no starving!). To support my body with additional nutrients I am taking Military Grade Nutritional supplements, which make me energized and toned. They are perfect for my active lifestyle. frequently. I am somewhat sure I will learn plenty of new stuff proper here! sometime soon. I want to encourage you continue your great writing, have a nice holiday weekend! lots of the information offered to thoroughly improve my body. Keep the fabulous content coming. This is the impending Fallout 4 Beta Keys. With this Fallout four Generator you will be capable to create beta keys to use on your Xbox 360|Ps3 |or even Personal computer. Providing you chance to enter the globe of the new redesigned Fallout 4 : Forgotten Buy in a beta section. We are a massive gaming community with plenty of keys on every platform. our database and find the unused legitimate keys and provide them to you in a single click. purposes are always up-to date. all sorts of cues and table pores and skin. Factors, Totally free 8 Ball Multiplayer Awards and final but not least Cost-free eight Ball Pool Multiplayer Accuracy Hack. You will almost often vehicle-get your 8ball online games. to earn all achievements or squander your valuable funds on pool cues, tables or boosts! in one particular simply click, You will be capable to modify quantity of coins you desire significantly. It gives a lot of attributes that no other tools will supply. Aren’t you tired of playing the game countless hours in order to generate the items in the game. What outcome you get by playing it like 12 hours a day. Small amount of items get increase and you’re happy with that. gems, resources and other things in the game. to have been distributed on the first day of the tax year in an amount equal to the fair market value of all the assets of the account on that first day; Reg. A number of them are rife with spelling issues and I in finding it very bothersome to tell the reality on the other hand I will certainly come back again. page and watch how they create news headlines to grab viewers to click. professional would be like the blind leading the blind. Even during bouts of low-self-esteem, self-care and emotional management techniques can help.